Homeless people are people who don’t have a permanent dwelling. Homelessness can be caused by many reasons, including, but not limited to, lack of affordable housing, forced eviction, gentrification, domestic violence, living with a disability or mental disorder, poverty, natural disasters, social exclusion, and more. According to 2005 statistics, an estimated 100 million people worldwide were homeless and 1 billion people lived as refugees, squatters or in temporary shelter, lacking adequate housing. 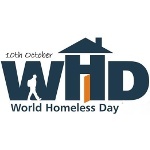 The concept of World Homeless Day was conceived in online discussions on the global issue of homelessness involving people from various parts of the world. It was marked for the first time on October 10, 2010. World Homeless Day is designed to raise awareness of homelessness as a global issue, to combat associated stigma (contrary to a popular misconception, not all homeless people are addicts or criminals), and to encourage people to get involved in responding to homelessness. The best way to celebrate World Homeless Day is to support local service providers for homeless people. You can volunteer at a homeless shelter or soup kitchen, donate clothes or food items, etc. Even if it seems like you’re not doing much, you’re still making a difference.